The object of a drawing my daughter, Marina, did a couple of years ago, has died. 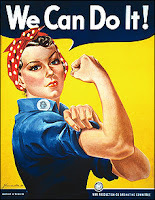 Geraldine Doyle, 86, who as a 17-year-old factory worker became the inspiration for a popular World War II recruitment poster that evoked female power and independence under the slogan "We Can Do It!," died December 26th. For millions of Americans throughout the decades since World War II, the stunning brunette in the red and white polka-dot bandanna was Rosie the Riveter. Rosie's rolled-up sleeves and flexed right arm came to represent the newfound strength of the 18 million women who worked during the war and later made her a figure of the feminist movement. But the woman in the patriotic poster was never named Rosie, nor was she a riveter. All along it was Mrs. Doyle, who after graduating from high school in Ann Arbor, Michigan took a job at a metal factory. One day, a photographer representing United Press International came to her factory and captured Mrs. Doyle leaning over a piece of machinery and wearing a red and white polka-dot bandanna over her hair. In early 1942, the Westinghouse Corporation commissioned artist J. Howard Miller to produce several morale-boosting posters to be displayed inside its buildings. The project was funded by the government as a way to motivate workers and perhaps recruit new ones for the war effort. Smitten with the UPI photo, Miller reportedly was said to have decided to base one of his posters on the anonymous, slender metal worker - Mrs. Doyle. For some 40 years Mrs. Doyle did not know the photo had become a famous poster. Shortly after the photo was taken she left her job at the factory and went to work at a soda fountain and bookshop in Ann Arbor. 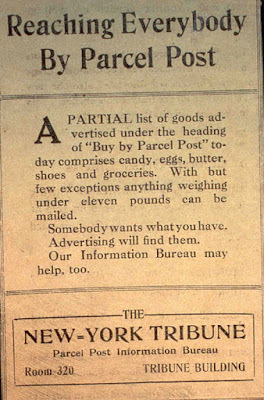 It wasn't until 1984 that Mrs. Doyle came across an article in a magazine that connected her UPI photo with Miller's wartime poster. For story about a 'local' Rosie the Riveter girl, read Marina's Rosie. Below is J. Howard Miller's poster and then the charcoal drawing by Marina (2008), then age 15. The first months of World War I had seen an initial German attack through Belgium into France, which had been repulsed outside Paris by French and British troops at the Battle of the Marne in early September 1914. The Germans fell back to the Aisne Valley and in the subsequent Battle of the Aisne, the Allied forces were unable to push through the German line, and the fighting quickly degenerated into a static stalemate with neither side willing to give ground. To the north, on the right of the German army, there had been no defined front line and both sides quickly began to try to use this gap to outflank one another. In the ensuing "race to the sea", the two sides repeatedly clashed, each trying to push forward and threaten the end of the other's line. By November, there was a continuous front line running from the North Sea to the Swiss frontier. The action was swift and both sides were determined. But, in December something unexpected happened: An unofficial truce involving about 100,000 British and German troops along the length of that front. The reason? Christmas. It began on Christmas Eve when German troops began decorating the area around their trenches in the region of Ypres, Belgium. The Germans began by placing candles on their trenches and on Christmas trees, then continued the celebration by singing Christmas carols. The British responded by singing carols of their own. The two sides continued by shouting Christmas greetings to each other. Soon thereafter, there were excursions across the 'No Man's Land, where small gifts were exchanged, such as food, tobacco and alcohol, and souvenirs such as buttons and hats. The artillery in the region fell silent that night. The truce also allowed a breathing spell where recently-fallen soldiers could be brought back behind their lines by burial parties. Joint services were held. In many sectors, the truce lasted through Christmas night, but it continued until New Year's Day in others. Ironically, just days before Christmas a group of 101 British women suffragists wrote a letter to the women of Germany and Austria. Under the heading "On Earth Peace, Goodwill towards Men, the letter said, "The Christmas message sounds like mockery to a world at war. Is it not our mission to preserve life? The next Christmas, the two sides again observed an unofficial cease fire at the front but it was not as successful, thanks to strongly-worded orders from the high commands of both sides prohibiting such fraternization. 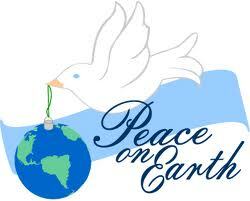 My prayer is that one day we will have peace on earth...may Christmas hasten that day. God bless you all and may each of you have a blessed Christmas! "Each of us carries upon his shoulders this bony sarcophagus, the grinning face of death. Within it resides the human brain, encompassing within its pulsating grey mass the totality of the cosmic consciousness. What a delicate instrument; capable of thoughts of inexpressible beauty, but often enslaved in mindless terrors by monstrous horrors that the mind cannot fathom, and indeed, horrors that may not exist except within the bony confines of the human brain box. This is Creature Feature... exploring the realms of the unknown. And now, from deep within the catacombs beneath our studios, here is your master of terrormonies, Sir Cecil Creape." Sir Cecil (pronounced ses-cil) Creape was creepy. As the announcer was introducing the show, Sir Cecil would descend from a stone staircase to the sounds of water dripping ever so slowly. When he finally reached the floor of his dungeon, in an unmistakable droll, Sir Cecil would say, "Did someone call?" Then he would look into the camera and say, "Oh, there you are!" The dungeon, that was supposedly deep beneath the studios of Channel 4, had rock walls and a large bookshelf, on which rested a few books, a skull, and a framed picture of Floyd Kephart, political analyst in Nashville during the seventies. 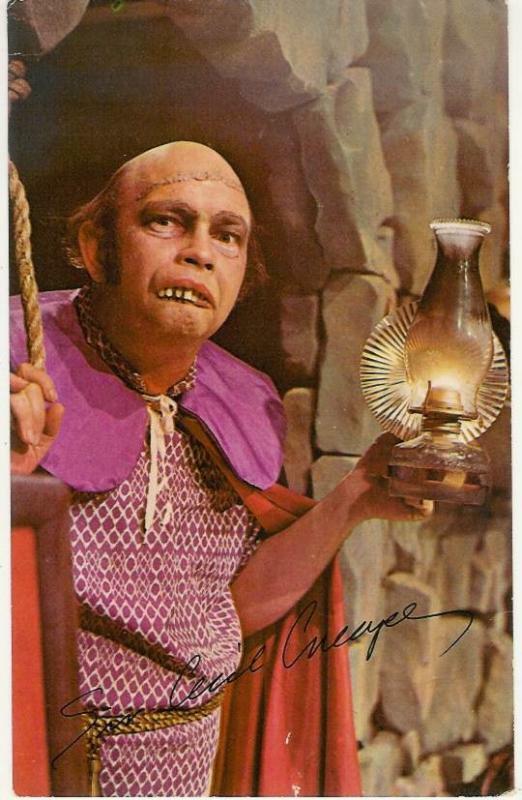 For some reason the protrayer of Sir Cecil (Whom I will reveal in a minute) thought it was funny to have a picture of Floyd on the mantle, and would refer to Floyd from time to time with such jokes as "Suffering Kepharts," or "That is almost as frightening as Floyd Kephart!" Sir Cecil Creape was actually Russ McCown, a film editor for WSMV. He had a long history of camera work and film editing - In fact, he was the person who shot the very first color commercial in Nashville in 1956. Russ got the name of Sir Cecil from Cecil B. DeMille, the lgreat actor/director of such movies as "The Ten Commandments." He later described his character as a cross between the Hunchback of Notre Dame and Oliver Hardy. Something else I discovered later on is that one of the main writers of the show was Pat Sajack, star of Wheel of Fortune. Sajack was an announcer and part-time weatherman at WSMV during my childhood. Wait, I hear the steady drip, drip, drip, drip of water. When we chose the name Marina for my daughter, I was a little skeptical at first because of all the marina's where I live, but she IS Marina and I could not imagine her name being anything else. Most people are named after their ancestors. 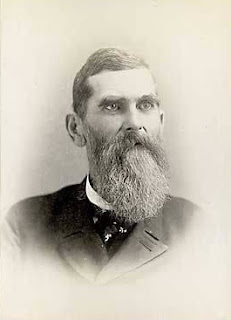 My great-great-grandfather was George Washington Boles. His cousin was Abraham Lincoln Boles. My great-grandfather was Ulysses S. Frost. His nickname was Grant. When I was born, my dad wanted to name me Roy Rogers Speck. "I think NOT," said my mom. I am glad, too. Sorry Roy, but a lifetime of always being serenaded with "Happy trails to you until we meet again," would have been a little too much. Western TV shows were popular back then, so it could have been worse. He could have wanted to name me Zorro or Festus. I used to tease my son, Elijah, by telling him that we almost named him Michael Jackson Speck. Although he would never admit it, for a few moments he actually believed me. 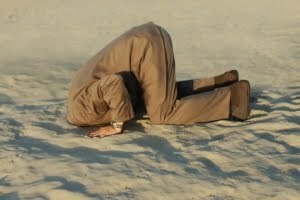 For the past several months, I have been keeping up with Rand Paul of Bowling Green. He is a Republican candidate for the U.S. Senate in Kentucky and he has become very popular. Fox and CNN are always talking about him and I have been thinking that, IF he wins the election, I might drop the Y from my first name, totally ditch my last name and start using my middle name. So, it would be RAND RAY. I said I MIGHT. I didn't say that I would. HAPPY TRAILS TO YOU UNTIL WE MEET AGAIN!! I was walking across the parking lot at the grocery store the other afternoon when, above the hustle and bustle of the busy street that lay behind me...above the noise of the shoppers walking to and fro the store in front of me, suddenly I heard the small voice of a child saying my name over and over! I looked toward the store in front of me and saw nothing. 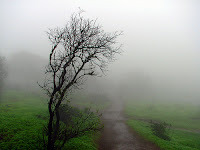 I looked toward the street behind me and saw nothing, I looked to my left and still NOTHING! For a second I thought that perhaps I had only imagined I had heard a childs voice calling out to me, but when I looked to my right I saw it. Across the street, in the playground area of the elementary school, were what looked to be at least a hundred kids enjoying recess, and right in the midst of all those children I saw an arm lifted toward the sky. The hand that was attached to the arm was waving frantically and it was then that I realized the voice that was saying my name belonged to none other than my 9-year-old niece, Chrissy. My first thought was, "My, what great eye sight you have!" My second thought was, "My, what a great set of lungs you have!" Better to love me with, I decided, as I held up both my arms and frantically waved back to her just like she was waving to me. I smiled as I turned to walk toward the store, wiping away a couple of tears as I went inside. 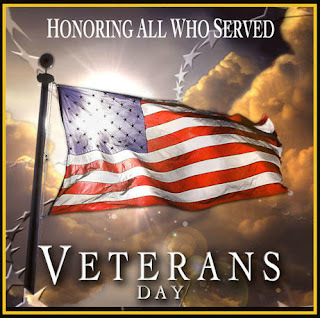 Italian poet and novelist Cesare Pavese once wrote, "We do not remember days, we remember moments. This was one of those moments. Unexpected but pleasurable. Thanks for the 'shout out,' Chrissy! In the spring of my 4th grade school year, I bought the newest album by the hottest rock and roll group in the world. I was totally swept away by the sixth song on side A. I liked the song so much that I immediately sat down at the piano and taught myself to play it. I was 10-years-old. The next day, I walked into music class, sat down at the piano and performed the song in front of the entire class. No sooner had I begun to sing and play the song, a girl came running up to the piano and stood there watching me. I couldn't help but turn my attention toward her. Her eyes were bright and her smile was wide, and it made me very nervous. Then as the song played on, I realized I had found something unique that I could do and the girls would like. It inspired me to want to do more, and I did. I had discovered a way to get girls' attention. I realized that if doing something that came so easy and was so much fun and attracted the attention of girls, that is what I wanted to do. The song was Let It Be by the Beatles. The album, of the same name, was released on May 8, 1970, shortly after the group's announced break-up. It was to become the Beatles' twelfth and final studio album. I can remember the TV reporting that some of the Beatles' members were unhappy with one another, specifically John and Paul. The rehearsals and recording sessions for the Let It Be album did not run smoothly. At one point during the sessions, George walked out and quit the group after severely arguing with both John and Paul, only to be coaxed back some days later. 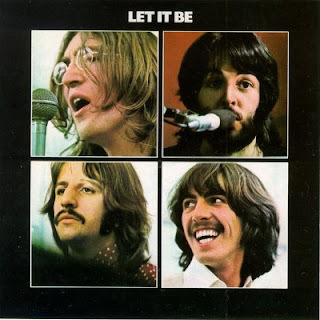 I will never forget that day in my 4th grade music class when I sang and played Let It Be. and the way it affected both myself and that girl, but mostly myself. Absalom Barden Wright was born on November 3, 1826 at the headwaters of Wolf River in Fentress County, Tennessee. At the age of sixteen, he was bitten by a copperhead snake inside his old home place. It was becoming dark in the old house, where Absalom had gone to pick up some oats. When he reached down to pick them up, a snake bit him on his right wrist. He left the oats behind, got on his horse and race the one half mile to his home. His father tried everything he could think of to help his son, but nothing worked. His shoulders, neck, and head became so swollen that it nearly prevented him from breathing, causing people to fear he would die from suffocation. As a last resort, Absalom was given strong whiskey to counteract the snake poison. He drifted off into unconsciousness about midnight. When he awoke about ten o'clock the next morning, he could hardly recognize himself. His right arm was swollen almost as large as his body! After recovering a little, Absalom felt as though he would rather die than to go through a like suffering again. For the next three spring seasons, Absalom’s arm changed to the color of a serpent and shed off the outside skin. His friends feared that his arm would have to be taken off, but eventually Absalom outgrew it. At the time Absalom was an unsaved boy and he knew it, and it made him shudder to think how near he was to the gate of death in an unsaved state. Absalom's convictions for sin grew heavier and from early boyhood he had a strong impression of mind that he should do considerable work for the Lord before he died. 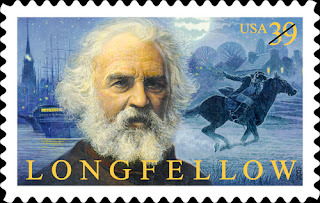 He would weep bitterly whenever he heard his brother, Edmonson, preach and earnestly appeal to sinners. He wrote, "I would think, if someone would only come and take me by the hand, how readily I would go to the anxious-seat and seek salvation." And so, at about three o’clock in the afternoon of Monday, August 28, 1843 in the Poplar Cove area of Fentress County, Tennessee, five miles west of Jamestown, the county seat, Absalom Barden Wright was happily converted to God. Bro. 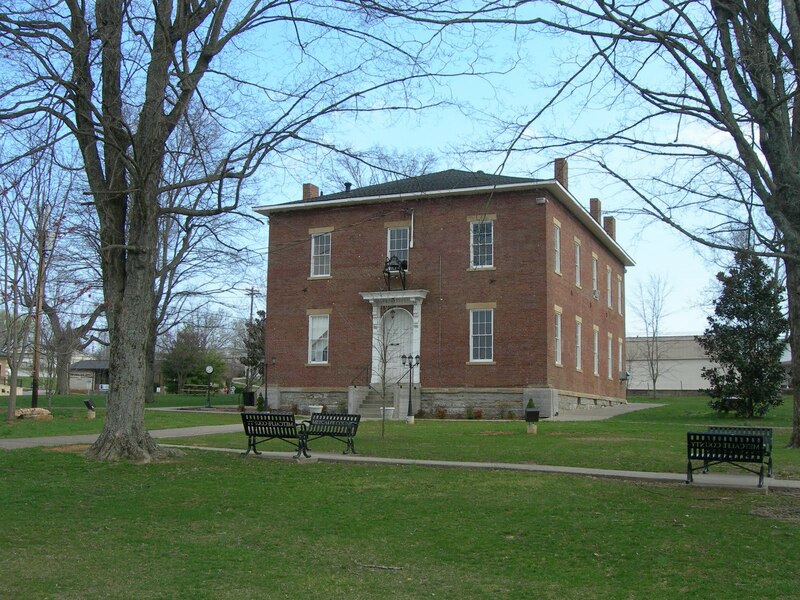 Wright was licensed to preach on July 31, 1848 during a meeting a Five Springs Methodist Church in Clinton County. For nearly 50 years, he boldly traveled throughout Tennessee and Kentucky preaching the Gospel of Jesus Christ. On November 8, 1893, Absalom was thrown from his horse and killed. He is buried at Wolf River United Methodist Church Cemetery at Pall Mall, Tennessee. James Cole was an innkeeper who came to America in the 1630's with his wife and four children and settled at Plymouth Colony. James was the first settler to live on Cole's Hill. The site is named for his son, John. According to Pilgrim Hall Museum, America's Museum of Pilgrim Possession, virtually all the historic sites relating to the earliest period of the settlement at Plymouth in 1620 have lost their original character and convey little impression of the colony. One exception is Cole's Hill. 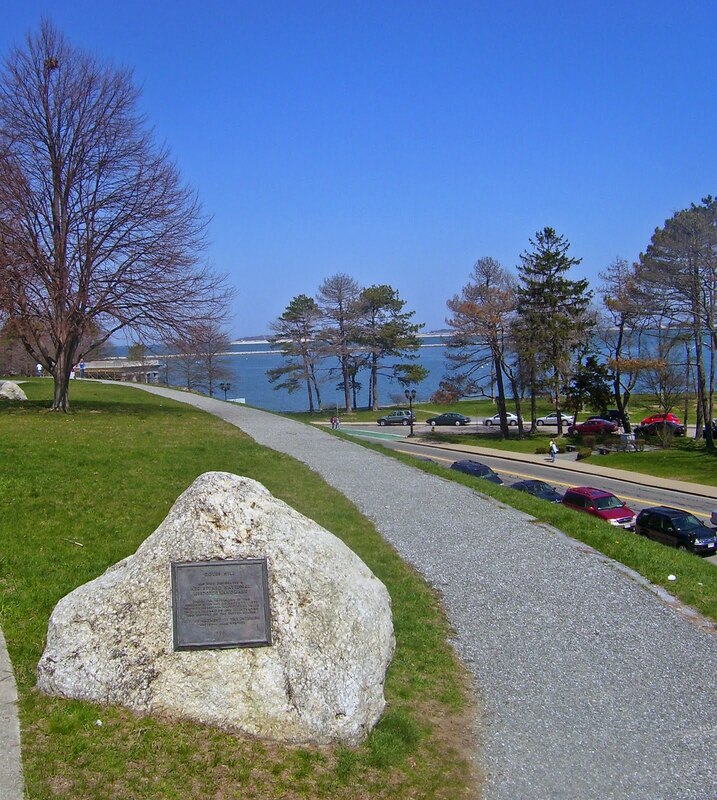 The view from the hill of land and harbor and sea conveys a vivid impression of the scene that greeted the Mayflower's weary passengers. The hill was the traditional burial place of the Plymouth colonists, Pilgrims, and others, who died during the tragic first winter of 1620-21. The dead were reportedly buried at night, and their graves disguised to prevent the Indians from learning the dangerously weakened state of the survivors. In later years, the colonists occasionally mounted cannons on the hill to ward off possible attack from the sea. Today, Cole's Hill is maintained by the Pilgrim Society as a public park. On its top stands the memorial to the Mayflower Pilgrims. At the foot of the hill is Plymouth Rock, the legendary landing site of the Pilgrims and stepping stone to the New World. Whether or not the Pilgrims actually landed on the rock, it has deep meaning for most Americans. Cole's Hill, the nearby rock, and the curving shores of Plymouth Bay memorably evoke the time more than three centuries past when Englishmen came to the shores of New England to stay. Just outside my church, Clear Fork Baptist Church, is a burial ground and in the far lefthand corner of that burial ground, near the back of the Church, is where several members of the David Mason Cole family are buried. David Cole was the great, great, great, great grandson of James Cole. He was born in 1777 in Washington County, Virgina and died here on March 4, 1861 at the age of 83. Shortly before the year 1800, he married Remember Woolsey of France. They had five children: Martha, Rebecca, James, Sampson and Sarah. Not much is known about Remember, except that just before the War of 1812, she and her family crossed the Cumberland Mountains from Virginia into Kentucky and settled along Clear Fork Creek. Remember died young, at the age of 33. David went on to became a prosperous farmer and stockman. On June 11, 1817, he purchased a 130 acre tract across the creek from Clear Fork Baptist Church from Alexander Beaty. It was there, near the current site of the Church gymnasium, that David built a large house. He eventually became a prominent landowner as the 1837 tax list shows him owning 540 acres on Spring Creek, and other lots elsewhere. Dode Dowell lived from 1858 to 1911 and was one of the most colorful characters ever in these parts. 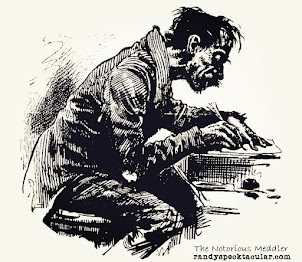 Short in stature with dark hair and leathery skin from the outdoor live he lived, Dode, whose real name was Duard Belmont Dowell, sported a droopy mustache and wore his hair parted low on the side to cover a scar left by brass knucks some long forgotten foe had once hit him with. Dode had a reputation for being a dangerous man in combat but he wasn't a mean man. He didn't look for trouble, but he didn't run from it either. It is said that Dode Dowell was a good business man, a farmer who dealt in livestock and tobacco, and also a merchant, horse stud farm operator and tavern keeper. But, that wasn't all that Dode Dowell was. He was also a legal moonshiner. His farm on Adam's Fork Creek, better known as Mell Ridge, was mostly an orchard. The fruit was used in brandy making and neighbors hauled fruit away in five barrel wagons for their own use at no charge. A government employee was always present at the making of the moonshine and also at the withdrawal of whiskey from the bond house. Occasionally, Dode would be arrested for selling whiskey illegally, but nine times out of ten he was found not guilty. He also appeared in court numerous times on firearms charges, disturbing the peace and so on. There are many stories about the life of Dode Dowell, but the one most told begins with Fannie Buckner, Dode's first wife. She was pregnant with their second child when Deputy Marshall Bill Stotts, entered their home one day threatening to kill Dode. The young Mrs. Dowell was so frightened by his threats that she suffered a miscarriage and then died herself a few days later. Believing his wife's death was entirely the fault of Stotts, Dode sent word that if he ever met him he would kill him. "Bill Stotts of Three Springs this county, while attending court at Edmonton last Monday, was shot and killed by an unknown person. While circuit court was in session about 3 o'clock in the evening a report of a gun or a pistol was heard and immediately thereafter Bill Stotts was seen falling down the stairs into the courtroom, blood gushing from his mouth and ears. Upon examination it was found that he had been shot in the center of the back, the ball passing entirely through his body. He died within a few moments without speaking a word. Roy Rutledge a young man who was upstairs and who had in his possession a Winchester Rifle and a pistol was arrested and jailed but it is not known whether or not he is guilty. The grand jury began to investigate the case and it is reported that a well known citizen of the county saw the killing and recognized the person who fired the shot. Stotts was on trial at Edmonton for shooting Bill Slinker's eye out some time ago. About 3 o'clock it is said that Dode and Tom Dowell, Rutledge and Hiram and Tom Pendleton were upstairs in the large room immediately over the courtroom and someone who does not seem to be known, came partly down the stairway and beckoned to Stotts and that the latter went up the stairway to the room above. Immediately the noise was heard with the shot, followed by Stotts rushing down the stairway mortally wounded. It is believed that the person in the room above decoyed Stotts upstairs for the purpose of killing him. They are the noted Dowells of Green County and their adherents. It is said the Dowells have been engaged in the manufacture of whiskey illicitly and that Stotts who has been in the Revenue Service, has given them trouble. Stotts seems to have been a bad man, but with all of his faults it looks as if he has been most foully murdered. Two of the Dowells and Rutledge have all been indicted for murder, The Dowells escaped while Rutledge is still in jail....the Dowells are desperate men and justice probably lost the only chance it ever will have of getting it's hands on them when they walked out of the courthouse after killing Stotts." "The grand jury at Edmonton last week returned indictments against Dode and Tom Dowell, two brothers named Pendleton and Roy Rutledge for conspiring together and killing Bill Stotts of this county in the court house of that place on Monday week. From the latest information received it seems that George Bushong an old gentleman from Rock Bridge, Monroe County, who had been upstairs in the County Judge's Office on the same floor where the tragedy occurred, came out of the judge's door just in time to see one man slap Stott's face, another hit him with his fist, a third kick him and as Stotts ran and was trying to escape down the stairs, still a fourth man shot him. The shot was fired from a pistol and not from a Winchester rifle as first stated. A Winchester was however found upstairs but had it's full complement of loads, 16, in it. Stotts himself had come to town with a goodly supply of arms in his wagon, a small arsenal in fact, but he seemed to have had no weapons with him when killed. Judge George R. Price the County Judge, also saw the shooting. He had been in his office with Mr. Bushong and was just coming out of the door too, when the shot was fired. He says Dode Dowell is the man who fired it, and as he did so and saw Judge Price had witnessed it Dowell shook his head at him. The pistol used was a Colt 44 and the ball passed clear through Stotts body and through several partition walls. Although only the Dowells, Pendletons, and Rutledge have been indicted Slinker and Johnson are suspected of being in the conspiracy to kill Stotts. Rutledge was the only one arrested the others making their escape, and it is said, have sent word to the sheriff of Metcalfe that he need not come after them as he will not get them. Rutledge is now in jail, and there have been rumors afloat that the Dowells and others would make an attempt to rescue him." In the confusion immediately following the shooting Dode descended the courthouse stairs and slipped outside, where he mingled with the crowd and got away. It's not clear whether he voluntarily surrendered or was captured, but according to old newspaper accounts the prosecution of his case began in December of 1887 and continued until 1890, when Dode Dowell was found not guilty. 2011 will be the 100 year anniversary of the passing of Dode Dowell. His legend will last forever, or at least as long as there is someone to tell the stories and someone to listen. The Colt 44 used to kill Bill Stotts is a highly sought item by collectors. Pictured above is the old Metcalfe County Courthouse at Edmonton, where Dode Dowell killed Bill Stotts in an upstairs room. 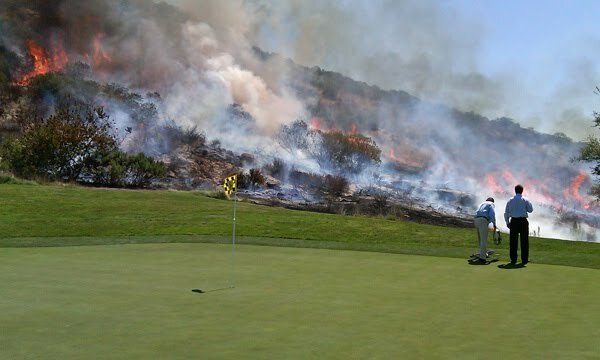 In golf, I have always heard the phrase, "Setting the course of fire," but I have never ever heard of a player doing that literally until now. Over the weekend, a golfer's routine swing in the rough at the Shady Canyon Golf Course in Irvine, California struck a rock. The impact caused a spark, and the spark set off a blaze that eventually covered 25 acres and, according to the Associated Press, required the efforts of 150 Orange County firefighters. The blaze required both helicopters and on-the-ground crews. The conditions were ripe for a blaze waiting for the right spark -- even from metal touching a rock. No charges are being filed and the golfer's name is being withheld. Prior to the War of 1812, Ahijah and Andrew Means, Jr. and a group of other men formed the Overton County Militia to protect their homes. The militia was commanded by Col. Stephen Copeland and was part of the 3rd Regiment, West Tennessee Militia Infantry in General Thomas Johnson’s Brigade. As the white population increased, the Creek Indians began to divide among themselves into those who held more traditional views and those who were more assimilated through contact with whites. Tecumseh tried to unite the Native Americans in a confederacy against white Americans. Most Upper Creeks, called "Red Sticks" because of their bright red war clubs, wanted to resist white encroachment. Most Lower Creeks, more accustomed to whites, were inclined toward peace. This division led to the Creek War of 1813-14. With the Creek already on the warpath, a war faction of the "Red Sticks" took part in a general uprising when a party of frontier settlers clashed with some native Americans at Burnt Corn, Alabama about 80 miles north of Pensacola, Florida. 250 people at Ft. Mims, just above Mobile, Alabama, were massacred and many others burned to death. When the news reached Nashville, General Andrew Jackson mobilized the Tennessee militia for a full-scale campaign. In January 1814 Jackson launched his campaign to drive south into the heart of Red Stick country between the Coosa and Tallapoosa rivers. A deep bend in the Tallapoosa River, known as Horseshoe, enclosed one hundred acres, furrowed with gullies and covered by small timber and brush. Across the narrow neck of the peninsula the Creek had built a log breastwork. At the point was a fleet of canoes to insure an avenue of retreat. On the morning of Sunday, March 27, 1814, Jackson sent 700 mounted militia and 600 Cherokee and Lower Creek allies to cross the Tallapoosa and surround the bend. Jackson and the troops of the Thirty-Ninth U.S. Infantry and Tennessee Militia Infantry, about 2,000 men including brothers Ahijah and Andrew Means, marched into the peninsula of the Horseshoe to confront the 1,000 Red Sticks behind their barricade. Jackson warned, "Any officer or soldier who flies before the enemy without being compelled to do so by superior force...shall suffer death." "Arrows, and spear, and balls were flying. Swords and tomahawks gleaming in the sun," said Sam Houston. Jackson’s hope was to breach the barricade. "For two hours "a brisk...galling fire" of cannon and musketry, a hail of iron shot and lead balls splintered the bark of the logs, but the "balls passed through the works without shaking the wall... Notwithstanding every shot penetrated...and carried with it death..still such was the strength of the wall that it never shook," Jackson later said. It was Ahijah and Andrew Means and the rest of the volunteer militia's job to guard the supply wagons, pack horses and wounded. They were located behind the three main positions in front of the breastworks. Records show that some of the regiment were wounded, indicating their position was breached causing the militia men from Overton County to join in the fighting. 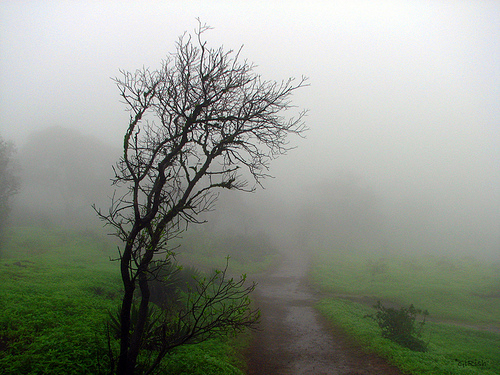 During a lull in the battle, a small cloud appeared. The Red Sticks, believing this was the sign they had been waiting for, fired upon the messenger of peace and resumed the battle with fury. The sign of deliverance brought only a quiet shower and the peninsula was strewed with the slain. The battle of Horseshoe Bend was over. 557 Indian dead were counted on the ground and the river held 200 more. All total, nearly 900 warriors are believed to have perished in this decisive battle. Jackson had lost 49 men and another 157 were wounded. On August 9, 1814, Andrew Jackson forced the Creeks to sign the Treaty of Fort Jackson. Despite protest of the Creek chiefs who had fought alongside Jackson, the Creek Nation ceded 23 million acres, half of Alabama and part of southern Georgia, to the United States government. 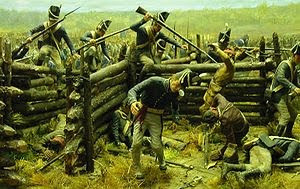 Even though the Creek War was largely a civil war between the Creeks, Andrew Jackson saw no difference between the Creeks that had fought with him and the Red Sticks that fought against him. Of the 23 million acres Jackson forced the Creeks to cede, 1.9 million acres was claimed by the Cherokee Nation who had allied with the United States. After becoming President, Jackson took the land ceded to his former allies, the Cherokees, together with other Cherokee lands in his removal of the Cherokees to the Oklahoma Territory. Chief Junaluska, the Cherokee Chief who saved the life of Jackson in battle and who led 500 Cherokees in support of Jackson at Horseshoe Bend, stated that "If I had known that Jackson would drive us from our homes, I would have killed him at Horseshoe." The Pay Roll Records for Col. Copeland’s company showed that for the 4 months and 5 days of service, Ahijah and Andrew Means and others in the Overton County Militia received $8 a month with a $2.86 subsistence, for a total of $36.19. When the militia men returned to Overton County, both Ahijah and Andrew left their home on Obey River and moved to Missouri where they lived the rest of their days. Ahijah and Andrew Means' brother, Benjamin, was the great-grandfather of William Ezra Means....my great-grandfather. President Dwight David Eisenhower once said, "There's no tragedy in life like the death of a child. 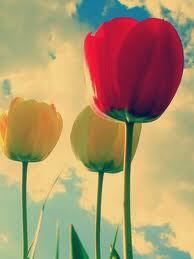 Things never get back to the way they were." The same can also be said for grandparents. I know so many things in my life ended with the passing of my grandparents, Cecil and Dimple Speck, in 1986. After he died, she said that she did not want to live without him and two weeks later she passed away. It was a sad time for my family. They were the cornerstone of our lives. Everything was built around them; holiday meals, love, encouragement and solid to the core advice. Suddenly all of that came to end never to be again, only remembered. I loved spending the night with them and sitting at the kitchen table listening to my grandmother tell stories from her childhood and stories of other family members. I think that is where my love for genealogy began. She would also read from the bible and would instruct us. I recall with great sadness the day she asked me why I had stopped coming to see her. You see, I had gotten older and I let things drag me away from her kitchen table. She died before I could go back there and I so sorely regret that. I believe that no one single event ever occurs; that whenever something happens, if you look around, you will find something else has occurred related to that one event. I believe the people in our lives; our family, friends, neighbors, even strangers we meet, are there for a purpose. I believe as we get older, we are able to retain certain memories and recall certain times in our lives for a reason. Like patchwork, the threads of life are woven together to make us what we are or what we are to become. That is how a friend of mine described it and I think she is right. Life is fragile and the older I get the more aware I am of just how fragile it really is. I read obituaries for a living and sometimes they are hard to read. The older I get, the more I know the name of the deceased. The very morning my grandfather, Cecil, died I had to read his obituary on the air. Someone commented later that they could not believe how I was able to do that. I just remember that it was hard to do. I grew up in radio and was surrounded by great men and women, who not only taught me everything about radio, but they also taught me a lot about life. I ended up writing and reading all of their obituaries and now I am carrying on without them. It isn't always easy. Watching them, and others, live and die has taught me to enjoy life more. I want to live my life to its fullest every single day that I have left. I am not interested in when I will die. I am going to enjoy today. I can't imagine living with someone for 50 years but I can understand why Dimple did not want to go on living after Cecil died. Laying in her hospital bed, with her children gathered around her and unable to speak, she took her finger and wrote B-U-Z-Z in the air. Buzz was my grandpa's nickname. She was telling them she wanted to go be with him. A couple of days later, she did. After my grandpa's death, my grandma began writing a poem, but she died before she could finish it. My dad finished it for her and read it at her funeral. In 1843, Danish philosopher Soren Kierkegaard wrote "It is perfectly true, as philosophers say, that life must be understood backwards, but they forget the other proposition, that is must be lived forwards." So, forward I go...one day at a time, weaving the threads of life as I go. I miss my friends and family who have gone on before me, especially Dolly Dimple Speck. To borrow a line from Kierkegaard, 'Of all the things I inherited from her, the mere recollection of her is more dearest to me. In 1794, after the destruction of the Cherokee towns of Nickajack and Running Water in the southern part of central Tennessee, a group of Chickamauga Cherokees moved west across the Mississippi River and into southeastern Missouri. In the winter of 1811-1812, the devastation of the great New Madrid Earthquake persuaded them to leave the area and move farther west into north central Arkansas between the White and Arkansas rivers. The Western Cherokee received formal title to their land by virtue of a treaty between the United States and the Cherokee, where the Cherokee Nation ceded an area in the east Nation equal to that land occupied by the Western Cherokee in Arkansas. Under this same treaty the U.S. government began actively encouraging Native Americans to move west. 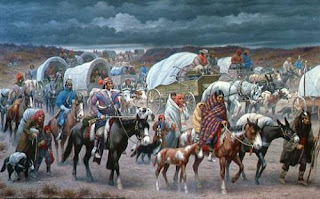 It became known as the Trail of Tears. The Choctaw were the first in 1831. The Seminole were removed in 1832, the Creek in 1834, then the Chickasaw in 1837. By the early 1830's, more than 4,000 Native Americans were living west of the Mississippi. Many Native Americans suffered from exposure, disease, and starvation while en route to their destinations, and many died. The Cherokee were the last to be removed. The U.S. Government tried to remove them in 1835, but most resisted, so they were forcibly removed. In the end, some 46,000 Native Americans had been removed from their homelands. Between 1839 and 1846, the Indian Nation became divided over who owned the land. A third treaty, signed in August of 1846, determined that the lands occupied by the tribe belonged to all the members. At the same time, the Federal Government admitted that it had, among other things, improperly charged the Cherokee against the $5,000,000 they received for their lands back East. Three lawsuits were filed with the United States Court of Claims ruling in favor of the Cherokee. As a result, over one million dollars was awarded to the Eastern Cherokee. The Department of Interior assigned a Mr. Guion Miller as special agent to identify those who were eligible to receive $133.18 that was given to each person. The Guion Miller Roll was made to distribute the money to all Eastern Cherokee that were alive on May 28, 1906, who could prove that they were members of the tribe at the time of the treaties of 1835, 1836 and 1845, or were descended from members of the tribe. Each applicant was asked for such information as full English and Indian name, residence, age, place of birth, name of husband or wife, names of children, place of birth and date of death of parents and grandparents, names and ages of brothers and sisters, and names of uncles and aunts. Mr. Miller released his report on May 28, 1909. Over 45,000 applications representing 90,000 individuals were filed with only 30,254 individuals being found eligible. 27,051 of those eligible lived west of the Mississippi River, with another 3,203 living east of the Mississippi River. According to the records of the U.S. Court of Claims, over 250 of the applicants claimed to be a descendant of Fannie Cobb, a full-blooded Cherokee who lived in Fentress County, Tennessee. Fannie Coker Cobb was my fifth great-grandmother on my mothers side. Her son, Jesse's granddaughter, Deborah, married George Boles, who was my grandfather's grandfather. According to the book, Extract of the Rejected Applications of the Guion Miller Roll of the Eastern Cherokee, Vol. 3, (2006) by Jo Ann Curls Page, several of the descendants on my mother's side were among those applications which were denied. 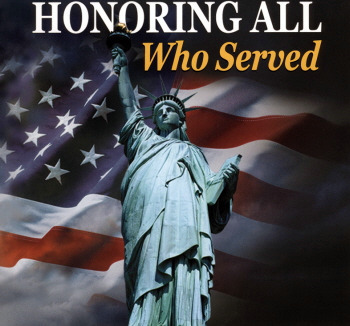 They included George and Deborah Boles and some of their children, including Barlow, Doll, Hige (my great-grandfather) and George's father, John Boles. In his claim filed in 1907, Deborah's brother, Asa Smith, wrote that he was applying "for such share as may be due me of the fund appropriated in favor of the Eastern Cherokees through my grandfather Jesse Cobb. His mother was a Coker and she was a Cherokee Indian. She married a Cobb, my mother's maiden name: Fannie Cobb." The claim was denied. If Fannie Cobb was a full-blooded Cherokee, then one of three things happened to cause their applications to be rejecrted. They either failed to fill out the applications correctly, failed to prove their direct relation to Fannie or they failed to prove she was a full-blooded Cherokee. Fannie Coker Cobb died five years before the U.S. Court of Claims ruling. Now, I'm not one for protesting, but when I was 10-years-old I witnessed one very big protest. The date was Thursday, May 28, 1970. The place was Neyland Stadium in Knoxville, Tennessee. Two of the most admired men in America were there: Billy Graham and President Richard Nixon. The protestors were actually standing next to where my group was. By the time Nixon rose to speak, they were chanting, "One, two, three, four, We don't want your (blank-ing) war!" I remember thinking how disrespectful it was to do that at a Billy Graham Crusade, but Nixon was there and he was the reason the protestors were there. It was during the Vietnam War and the tragic shootings at Kent State had occured just a few days earlier. Nixon had gone into seclusion at the white house and he saw the Graham crusade as a chance to be seen in a more positive light. He did not count on such a major protest occuring. The chants used by the protestors were frequent and loud, but Nixon seemed to draw strength from it. Time magazine called his speech that night one of the greatest of his presidency. Not wanting to disrupt the religious part of the service, the protestors eventually filed out of the stadium. I can remember some of them were singing John Lennon's "Give Peace a Chance" as they left. It was quite the scene for a 10-year-old boy to witness. Funny, but it does not take much to update this 1965 Barry McGuire hit to fit today's scene. Bob Dylan once said, "The times they are a-changing." For a more detailed story on Richard Nixon's appearance at the Billy Graham Crusade, read my Nixon's Night Out.